Stop for a second and think about all the things you've imagined with Bluetooth connectivity. Now narrow that list down to all the absurd, goofy, or just downright ridiculous ideas you've had just for a laugh. Done? Good. Here's an idea so outlandish that I bet it never even crossed your mind. Oral B just announced a Bluetooth-connected toothbrush (can we just call it a Bluetoothbrush?). With an app. It's going to be on display at Mobile World Congress. A customized brushing experience. A guide on how to brush your teeth. Performance tracking. Achievements. I still can't believe this is a real thing. I will say this, however: the pressure monitoring feature is actually pretty neat... but it seems like that's something a brush could do without the need for an app. Or Bluetooth. You know, like a normal toothbrush. Anyway, there's no word on how much this brush will cost – just got word from Oral B that it will be priced around $219 in the US, 219 Euros, and 199 British Pounds – make ready those credit cards, boys! It will be available in June of 2014, with Android app availability the following month. CINCINNATI--(BUSINESS WIRE)--Oral-B® will introduce its interactive electric toothbrush – the world’s first of its kind with Bluetooth 4.0 connectivity – at Mobile World Congress 2014 beginning Monday, February 24. As an essential element to the well-connected bathroom, the product will be showcased in the GSMA Connected City exhibition space, a realistic city environment showcasing cutting-edge mobile products and services for the increasingly connected life. Available for purchase in limited quantities this spring, the product is poised to set a new standard in personal oral care. This new innovation gives you unprecedented control over your oral care, and in turn, the outcome of your dental appointments. Via Bluetooth 4.0 technology, the interactive electric toothbrush connects to the Oral-B App that provides real-time guidance while you brush, and records brushing activity as data that you can chart on your own and share with dental professionals, helping to create smarter and more personalized brushing routines. Utilizes Two-Way Communication: Not only does that app receive brushing data and report it back to you, but you can also program the app so that it communicates with the brush for personalized brushing. Delivers Expert Guidance with Focused Care: The purpose of this new technology is not to outsmart dental professionals, but to work hand-in-hand with them. Dental professionals can program patients’ brushing routines in the app to help improve their brushing behaviors and focus on problem zones within the mouth. Programs Personal Brush Settings: You can use your smartphone as a “remote control” to customize your brush to your needs, including setting your target session length and selecting your preferred modes. Stores Your Data: It is not always convenient or easy to remember to have your smartphone in the bathroom while you brush, so the Oral-B interactive electric toothbrush handle can store up to 20 brushing sessions. The data is transferred the next time the app is connected to the toothbrush, updating your records. Fosters Better Brushing: The app and interactive electric toothbrush help drive patient compliance, which determines a large part of the success of dental appointments. Helps You Stay Informed: The app helps maintain your attention and motivation while brushing with news, weather and oral care tips. Additionally, pre-tests of the app have shown that when connected, brushing time increases from less than 60 seconds with a manual toothbrush to two minutes and 16 seconds with an electric toothbrush, surpassing the dental professional-recommended two-minute per session. Oral-B’s participation in the GSMA Connected City marks the first time an oral care brand has debuted its mobile capabilities at Mobile World Congress, the largest and most premier exhibitor in mobile developments. 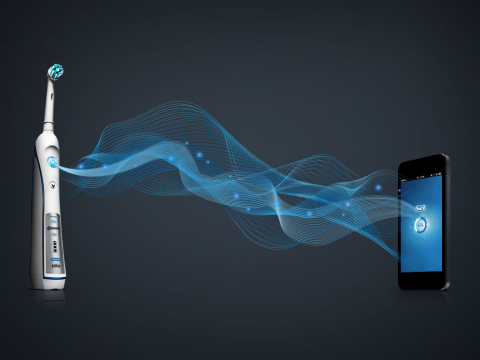 The new Oral-B interactive electric toothbrush with Bluetooth 4.0 connectivity and the Oral-B App will be available in limited quantities in Germany this spring, with a global rollouts – including the SmartSeries – launching in June 2014. The new Oral-B App will be available in iOS in May, and in Android in August. For more information on the new SmartSeries and other Oral-B electric toothbrushes with Bluetooth 4.0 connectivity, visit connectedtoothbrush.com.